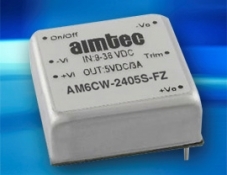 The AM6CW-FZ series is an addition to our 6 Watt DC to DC converter line. This new converter operates with an ultra wide input of 4:1 (9-36, 18-75VDC) input ranges and are housed in a miniature 1x1 inch package. This versatile product is feature rich with input to output isolation of 1500 VDC, plus continuous short circuit protection, over voltage protection, over load protection, remote on / off control feature, plus with an operating temperature range of -40°C to +85°C (with derating starting at 60°C for 3.3 and 5V models and 70°C for all other models).